Aqua is in the eye of the beholder. The name can be applied to shades of blue-green ranging from aquamarine to cerulean to turquoise to Tiffany and Maya blue. Wave your paintbrush — or a light wand — and make aqua by combining blue and green or a lot of blue with a little yellow. Aqua…the color of tropical waters, warm playful waves, healing and tranquility. For October, Beading Divas bracelet sales benefit SAVER (Southern Arizona Veterinary Equine Rescue), a non-profit organization that rescues, rehabilitates and re-homes abused, abandoned and neglected horses confiscated by the Animal Cruelty Task Force..
All bracelets are handcrafted, one-of-a-kind and made with donated beads. Bracelets cost $20, no tax. SAVER receives $20 for every bracelet they sell person to person and $18 for every bracelet sold online. Postage is based on destination. Bracelets are mailed worldwide. 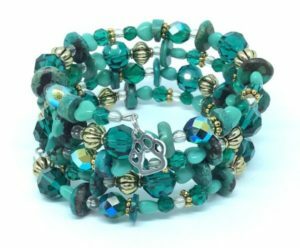 From the Feedback File: “Thank YOU once again to the Beading Divas for helping me send a beautiful bracelet gift. Love your shop’s donations to Tucson-Southern AZ area animal rescue organizations. My friend is thrilled and I am happy! :-)” ~June C.